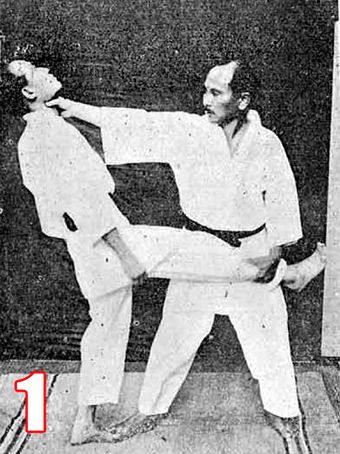 In this brief article, I want to discuss the “forgotten throw” of Gichin Funakoshi i.e. Nodo-Osae (“throat press” or “pressing the throat”). While a growing number of karateka are familiar with the nine karate throws Gichin Funkaoshi shows in his 1935 book Karate-Do: Kyohan, fewer are aware that they are not the only throws Funakoshi recorded in his written works. In his earlier 1925 book, Rentan Goshin Karate Jutsu, Gichin Funakoshi showed six throws. One of those throws – which is not included in the nine of Karate-Do: Kyohan – is Nodo-Osae. Many assume that the technique is a defence against a kick, and that Funakoshi simply catches the kick. I believe that to be incorrect. The strongest piece of evidence for this is the photo of the method in the earlier edition of the book (Ryukyu Kempo Karate, 1922). This book shows the same throws as the 1925 book, but using a different set of photos. The printing plates for Ryukyu Kempo Karate were destroyed in an earthquake in 1923. However, demand for the book was great enough to justify a new edition – complete with new photographs and illustrations – and that became the 1925 book Rentan Goshin Karate Jutsu. However, Ryukyu Kempo Karate and Rentan Goshin Karate Jutsu are essentially the same book. This means we can compare the photos of Nodo-Osae in each book to see if extra information can be gained. In Ryukyu Kempo Karate we can see the throat hit, but the leg of uke is still on the floor (Photo 2). This makes clear it is not a “kick catch” but that the intention was for the leg was to be lifted during the technique. Funakoshi even appears to be looking at the leg he intends to lift as uke’s weight shifts backward. The video below (from a few years ago) shows how I reconstruct the throw. It’s not a “kick catch” but a lifting of the ankle based on the unbalancing effect of the hit / push to the throat. As you’ll see, it is as effective and efficient throw that I believe should be given its rightful place alongside the nine throws of Karate-Do Kyohan. It’s a method all karateka should know. For interest, here is a comparison of the photos used for the other throws in the 1922 and 1925 books. The Ryukyu Kempo Karate (1922) photos are on the left. The Rentan Goshin Karate Jutsu (1925) photos are on the right. 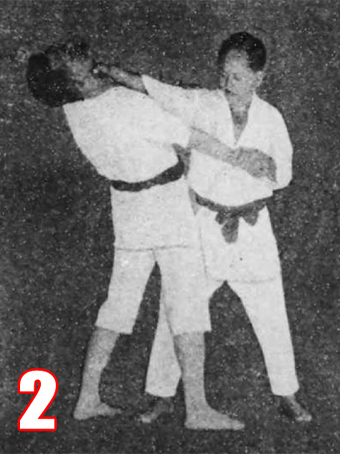 One important thing to note is that Funakoshi renamed a few of these throws when they appeared in Karate-Do: Kyohan (1935) and this has been known to cause confusion. For example, “Taniotoshi” is renamed “Gyaku-Zuchi” (upside-down hammer) and the label “Taniotoshi” is now applied to a shoulder throw (what would be “Ippon Seoi Nage” in judo). There are numerous other changes too i.e. “Nejidaoshi” is now “Koma-Nage” (spinning top) and so on. We therefore need to take care with the terminology and be clear on which set of names we are using when discussing these throws.